Yacht Club at Drai’s sailed onto the Las Vegas club scene this past summer, and the late night swim party was an instant splashing success at the new 35,000 square foot Drai’s Beach Club. Premiering at Drai’s famed After Hours nightclub located underground at The Cromwell, Country Club takes the Tuesday night party and moves it below deck beginning on Tuesday, Oct. 21. 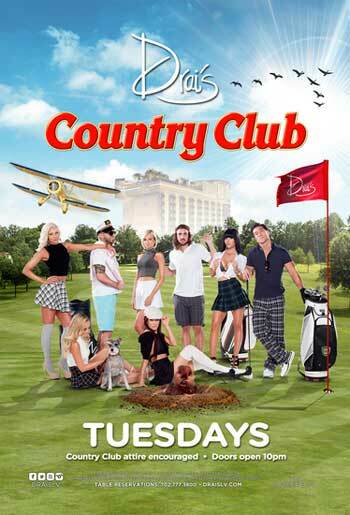 Today, the days are turning shorter and the night’s cooler, and the Drai’s team is set to tee off a new Tuesday night tradition, Country Club. Country Club will make its Las Vegas debut inviting guests to swap their summer bikini’s and board shorts for their best country club chic gear, plaid shorts and pleated skirts. In the tradition of the greatest golf movie ever made, Caddy Shack, Country Club at Drai’s will no doubt become an instant classic – filled with incomparable characters, stylish garb and of course, Drai’s version of the ultimate golf/country club inspired party. Since creating the after-hours concept in Las Vegas more than 15 years ago, the famed below ground venue will now welcome guests to Las Vegas’ most exclusive club; which for the first time will open its doors at 10:00 p.m. (only on Tuesday nights).